The last time we heard about the next-gen Amazon Kindle Fire tablets, we heard that the displays on the devices would be packing quite a number of pixels, and now we're getting a more detailed idea of what to expect from the internals of the devices. And, the good news is that it looks like Amazon is going for some very impressive specs, including the spec nerd dream SoC: the Snapdragon 800. All of the new Kindle Fire tablets are said to have a quad-core Qualcomm Snapdragon 800 (MSM8974) system on a chip with prototypes clocked at 2GHz, which features four Krait 400 CPUs and Adreno 330 graphics, 2 GB of RAM, a front-facing camera, and Wi-Fi and cellular options. The 7-inch Kindle Fire HD tablet has already been reported to be bumping the display resolution to 1,920 x 1,200, while the 8.9-inch Kindle Fire HD model is expected to have a 2,560 x 1,600 resolution display. The 8.9-inch is also expected to have an 8MP rear camera, but the 7-inch will not feature a rear camera. The entry level 7-incher will reportedly have an 8GB storage option, and all of the tablets will have 16, 32, and 64GB storage options. 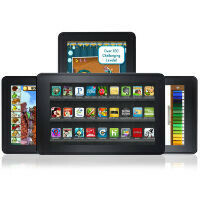 The new Kindle Fires are said to be running Android 4.2.2 with the usual heavy customizations from Amazon. And, the tablets are expected to be thinner and lighter than the previous generation with the bezel on the 7-inch model measuring about half an inch all around, and the 8.9-inch model’s bezel is about three-quarters of an inch wide. The tablets are aiming for release in the fall, but there are no prices known yet. The current 7-inch Kindle Fire HD retails for $199, with the 8.9-inch at $269. Given the specs, it is unclear if Amazon will be able to keep the prices that low again. nah, i would never pay money for a tablet that features ads on the lockscreen. I've always admired the specifications of the Kindle Fire but I don't really care for the UI. It just seems too heavy. Strangely, I find the Nook's UI to be better in my opinion. No thanks… the google experience is more important than the number of megahertz. You can always root the KF... Just saying. Kindle is not a full Android tablet so expect an update. I may be wrong but I thought kindle fire is not full android, so does it really need sso much power? To handle all the bloat amazon adds yes it needs the power, all that extra UI stuff that OEM add to android make it clumsy and slower and eats up lots of RAM. Android by itself is ightweight on the RAM side but when you take a look at OEM modified Android OS you notice sense, touchwiz and the like take up a considerable amount of onboard RAM just to run and it will still have secondary apps for things like keyboard and such which are part of their UI tweaks. Yes, like Kindles need specs like that. I don't get cameras for tablets honestly. Why ANYONE would buy this when they could get a Nexus 7 is beyond me. There is NOTHING you can do on the Kindle that you can't on the Nexus, but on the Nexus you can do so so much more. Perhaps if the cost was half of the Nexus it would be interesting, but with specs even remotely close, it's Nexus EVERY TIME. Why limit yourself to a tablet with a watered down selection of apps? While I agree with your premise (I bought a new Nexus 7 three days ago), technically you are incorrect. The Kindle can borrow books from the Amazon Prime lending library. It also run the Amazon instant video app. Those are two things the Nexus can't do. As for everything else you would use a tablet for, the Nexus is a much better tablet. Yea this is dumb, cause i totally need a Snapdragon 800 with 3GB of ram to read a book. Nice job Amazon.